泰国曼谷.Ashton Asoke@ Sukhumvit, Bangkok – SOLD OUT! Luxury High-Rise Condominium 50-storey building. 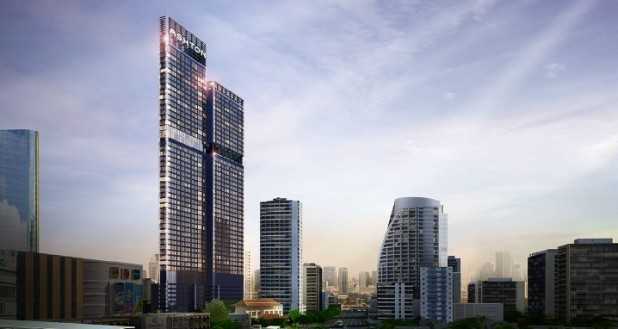 Asoke is one of Bangkok’s busiest business district after Silom, is home to office buildings, high-end serviced apartments, hotels and a range of standalone textile and furniture boutiques. Terminal 21 Shopping Mall is a 9-storey shopping mall house some 600 shops, a Cinema, Supermarket and a food court with all kinds of mouthwatering Thai and International fare. Terminal 21 is uniquely designed to look like an airport and named for its resemblance to an airport terminal. The shopping is just right next to the busy Asoke intersection, connected with the BTS Asoke and MRT Sukhumvit stations. Shoppers can expect the combination of unique destinations from around the world such as Rome, Paris, Tokyo, London, Istanbul, San Francisco and Hollywood in one fully-furbished department store. Each floor of this Bangkok shopping mall has a different theme based on various cities around the world, so it’s like traveling to a new shopping venue when you hit each floor with gorgeous statues and icons of each city placed in their respective sections. Why Ashton Asoke@ Sukhumvit, Bangkok? Ground Floor: reception hall will be a part of – Semi zone, the reception – inside the zones, a letter (Mail Box), meeting rooms (Meetiing Room), corporate offices, Concierge Marge. , garden and parking. 2nd – 9th floors will be carpark. 10th floor is a garden area, workshop. 11th – 34th floors are all residential. 35th – 35M floors will be a social club, swimming pool, children’s pool, jacuzzi, gym, changing rooms. And bath, a steam room, a sauna, a library and business center, laundry room, Sky Lounge. 36th – 46th floors are all residential. 47th floor residential and garden. 48th – 50th floors are all residential. Roof has a rooftop garden. The remaining 70% will be paid by bank loan/ cash upon completion. “Flipping” is allowed! For resale/ rental, the developer have its dedicated (subsidiary company) team to assist you. For Early Birds, purchasers will be entitled to early birds discount * from the List Price.